There are quite a lot attractions and things to do in Chiang Mai, after all it’s one of the most popular cities with travelers, backpackers and digital nomads in Thailand. Which activites you can do and which sights you have to see while you’re in Chiang Mai, we will tell you today in this article about things to do in Chiang Mai. Besides the old town, night market, trekking tours and other excursions, the city has still a lot to offer and my 13 things to do in Chiang Mai are of course not everything you can do. I could write a whole book about this beautiful city, but to inspire and encourage you to visit the “Rose of the North” you will get to know some of the most important sights in this article. Since Chiang Mai is a popular tourist destination in Thailand, you can reach the city by airplane, bus, train or minivan. You can even take international flights to Chiang Mai e.g. from Singapore, Doha, Seoul, Beijing and more. 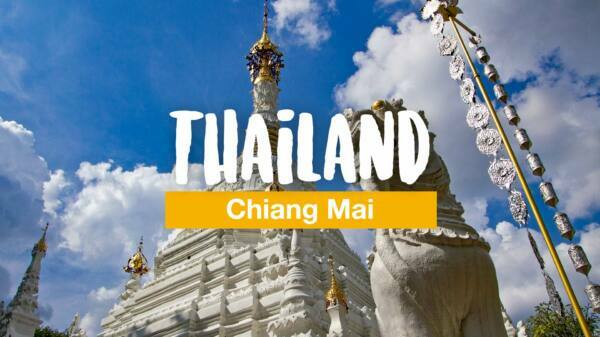 You can also fly to Chiang Mai from many locations within Thailand. 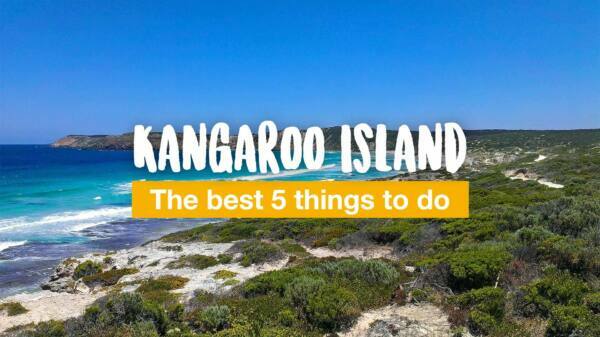 This starts with short flights of 45 minutes e.g. 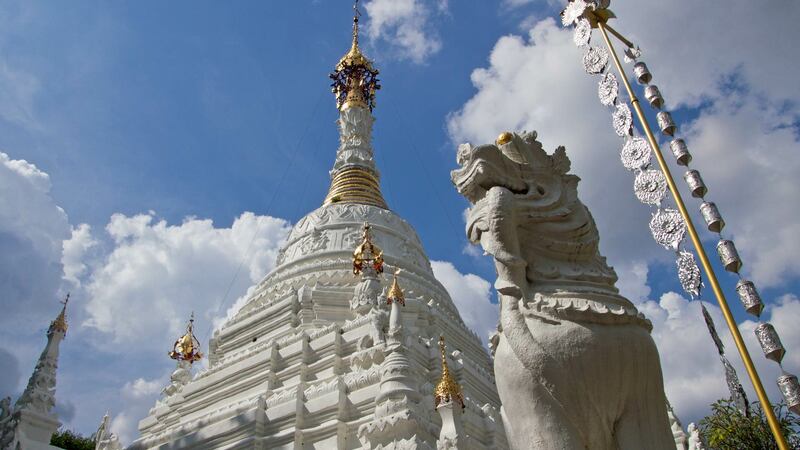 from Mae Hong Son, continues with flights from the capital Bangkok and the south with Phuket or Surat Thani. All connections for a good overview are best found at Skyscanner. Furthermore, there is a train connection from Bangkok to Chiang Mai, but it usually takes 12 hours or more to arrive. Bus and minivans also drive from many different cities to Chiang Mai such as Pai, Chiang Rai, from the Isan, Bangkok and more. For an overview and to book tickets we can recommend our partner 12go.asia. Villa Sirilanna is located in the heart of Chiang Mai, more specifically in the Old town. From there you can explore the area wonderfully. Particularly noteworthy is the decor of the rooms in the traditional style, as well as the pool. We are sure that you will feel comfortable in this small oasis in the middle of the city. Find more hotels in Chiang Mai here. 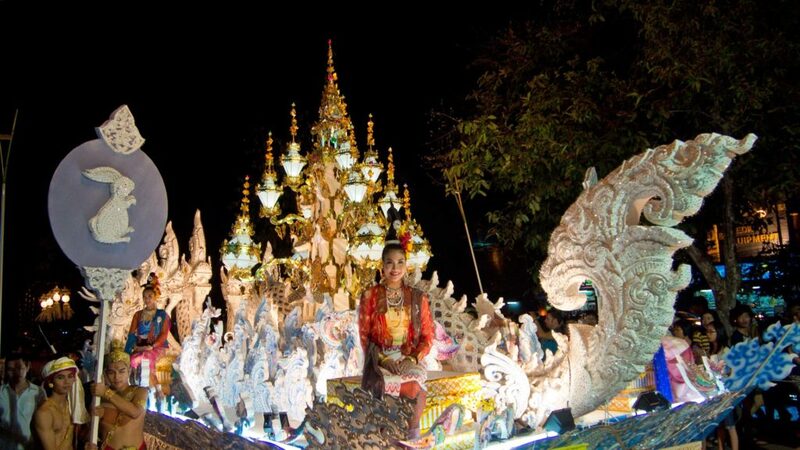 Chiang Mai has so many temples that you even couldn’t visit them all – unless you spend a really long time in the city. There are countless beautiful temples and each is different. Sometimes they have a huge Buddha statue, some huge Chedis, some are built of silver and some of wood. Three temples that I can recommend to visit are the Wat Umong, a temple inside a forest a little bit outside of the city center. The second would be the Wat Sri Suphan. A very beautiful temple which is covered with silver. The entrance is at the Wualai Road. The third temple to recommend is the Wat Phra Singh with some nice Chedis, a huge reclining Buddha and it’s really easy to find since it’s in the center of the old town. Another alternative would be a temple tour with a local guide. The guide will give you insider knowledge about the individual temples, which you would miss otherwise. The view at Chiang Mai is stunning and a really good spot for enjoying that view is the Wat Phra That Doi Suthep. Either way by day or night, the view is just terrific and a recommended thing to see while staying in Chiang Mai. But there are some more viewpoints on the way to the Doi Suthep where you can take a break. Those views are not bad at all, but I prefer the view from the temple itself because it’s obviously higher than the other ones. You can find another great viewpoint at the Wat Phra That Doi Kham a little bit south of Chiang Mai. If you have a couple of days in the city you should definitely go on a trip to that temple. 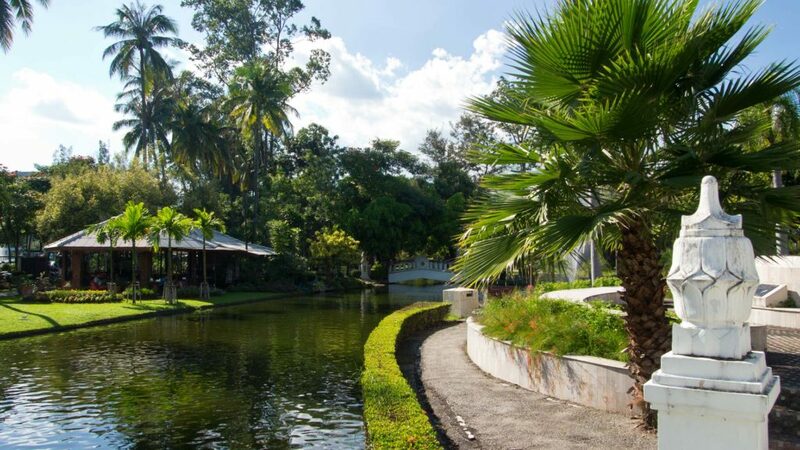 At the southwest corner of Chiang Mai’s old town you can find the Nong Buak Haad City Park. Just a little walk from the Chiang Mai Gate. A great spot to get away from it all and relax a bit. Many locals come here for jogging, aerobics or just to relax. You can borrow a mat for 20 baht, pick a spot on the lawns and watch the madding crowd. You can also buy some small snacks and drinks in the park and from time to time the ice cream vendor comes by. There are some stalls selling delicious ice coffee and in front of the entrance you can buy a Papaya Salad or chicken as well. The atmosphere is really great and it’s mostly nice and quiet. A nice place to get away from the “big city” for a bit. Every weekend there is a huge walking street in Chiang Mai. On Saturday it’s located opposite the Chiang Mai Gate. From the old town you have to go across the moat and follow the crowds. You can buy almost everything at the walking street – clothes, souvenirs, CDs etc. But most of all, there is a huge offer on different foods. You should arrange enough time if you want to visit the walking street. It could take up to 2 hours to explore the whole street. One of the must things to do in Chiang Mai. The walking street on Sunday is located inside Chiang Mai’s old town and is even bigger than the Saturday Walking Street. 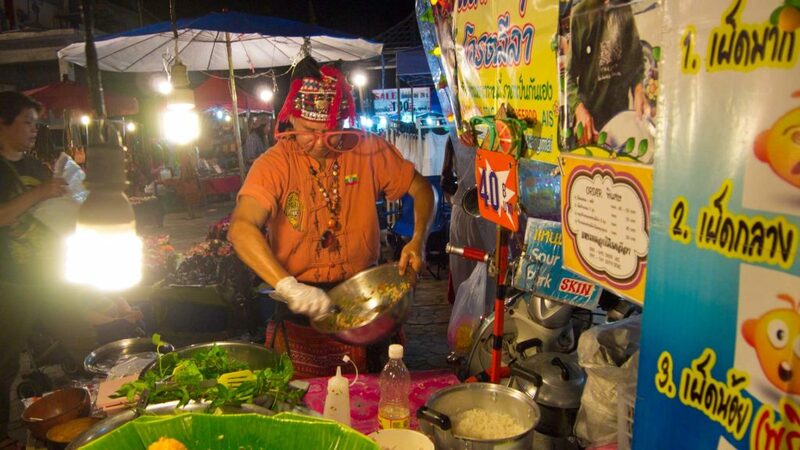 Many of the stalls are the same on both days, but the offer on food is even more varied and the size of the walking street more impressive. If you are staying at least 2 weeks in Chiang Mai, I would recommend you to visit the Saturday Walking Street in one of those weeks and the Sunday Walking Street during the other week. Most of the stalls open around 5.00 – 6.00 p.m. and close around 10.00 or 11.00 p.m. There should be plenty of time to calmly explore everything. The Hang Dong Canyon, also known as Chiang Mai’s Grand Canyon, is located south of the city near the town of Hang Dong. You can easily do this trip with a scooter. Just follow the main road south to Hang Dong until you reach the Hang Dong Golf Club. Then turn right. Now you can follow the signs to the Grand Canyon Café and enjoy the beautiful view as seen on the picture with a nice coffee for example. If you like you could drive to the other side of the canyon afterwards and go for a swim. Still an insiders’ tip! If you are staying in late October/early November in Chiang Mai, then you shouldn’t miss the Yi Peng Festival. Many people especially visit Chiang Mai during this time of the year to attend the festival. It takes places on the grounds of the Mae Jo University and is a dream coming true for many travelers. The Lanna Kathina and Lantern Release Ceremony is part of the bucket list of many travelers and is organized annually by an independent Buddhist group. The local festival is free of charge while there is another expensive festival for tourists about a week later. 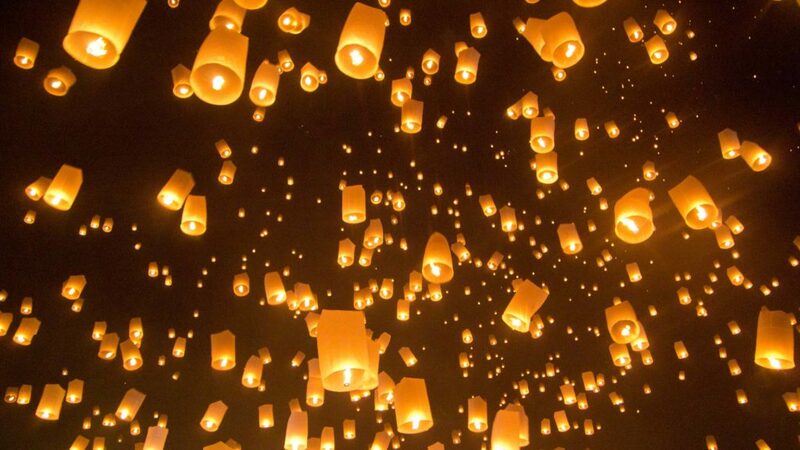 You should definitely experience the rise of these masses of lanterns once in a lifetime. An event that you won’t forget so fast. Loy Krathong is one of the largest festivals in Thailand, also known as the Festival of Lights. It takes place on the full moon day of the twelfth month of the Thai lunar calendar. Usually this falls on the beginning of November. Roughly translated, Loy Krathong’s meaning is floating raft. This is very appropriate because the Thais launch small handmade oder bought boats, e.g. from banana leaves, to the water. Previously they place a hair, a piece of fingernail and a coin inside the boat and pray briefly. Then the boat carries away all the worries of the past year. This festival is especially huge in Chiang Mai and is celebrated for 3 days. There are organized parades with big decorated cars from the old town to the banks of the Ping River. 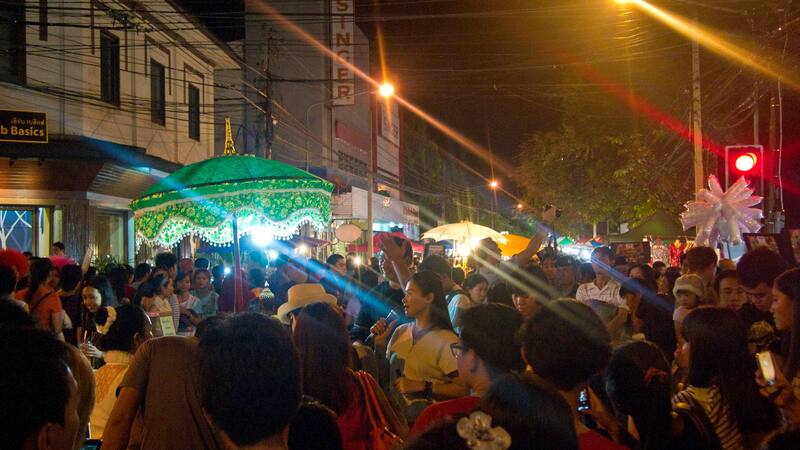 As well as a Miss Loy Krathong contest at the Thapae Gate and many more activities. Also, there is a big festival site along the river with lots of games like at a carnival and countless stalls with food. A wonderful experience that I can recommend to everybody who is visiting Chiang Mai during those times. 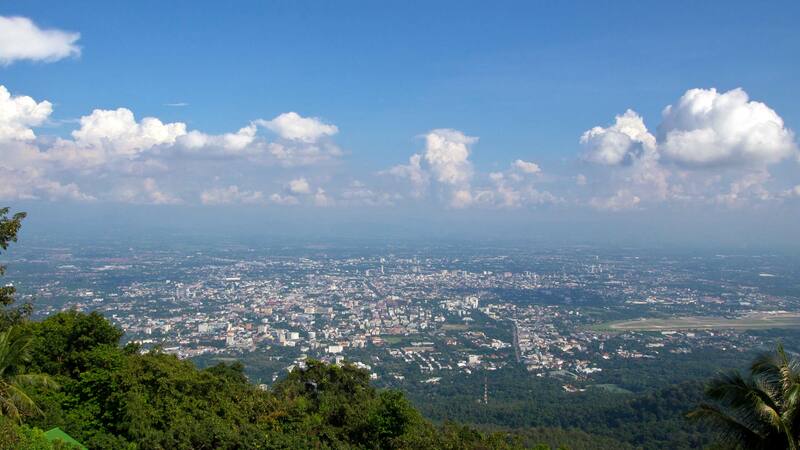 Chiang Mai is surrounded by an incredibly beautiful and varied landscape and many people come to Chiang Mai to do some jungle trekking or hiking. There are countless different providers where you can book the trip and many other things like whitewater rafting, swimming in the waterfalls and visiting a Karen (long neck) village, that you often find in the lower mountain areas. Two providers of those tours are Travel Hub Chiang Mai and Chiang Mai Jungle Trekking, but you can also find many providers in the city. Just compare a few offers and prices and choose a provider which suits your needs best before you head out for a tour. 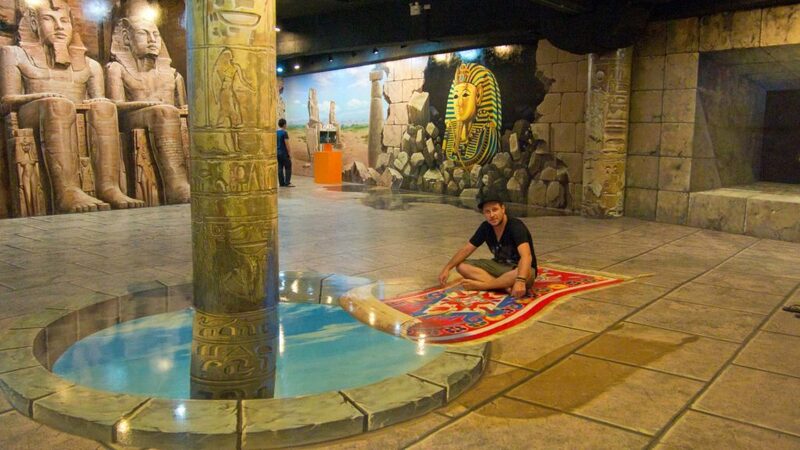 If you want to experience something different, I can recommend the Art in Paradise 3D museum. The admission of 400 baht is a bit more expensive, but definitely worth it. You can also buy the ticket online for 300 Baht. From the outside the building looks really impressive, like a kind of fancy museum. All the more, the art inside of it is very surprising. You will walk through many epochs of time, underwater worlds and many famous places around the world. The paintings are really fantastic and sometimes it looks like you are actually a part of it. Sitting on a flying carpet, falling into an abyss or surfing some waves. Just terrific! If you want to visit a zoo in Thailand, you can do that also in Chiang Mai. The Chiang Mai Zoo has a huge area where you can walk around easily for a couple of hours to discover it. Here you can see penguins, koalas, pandas, lions, giraffes and many more animals. 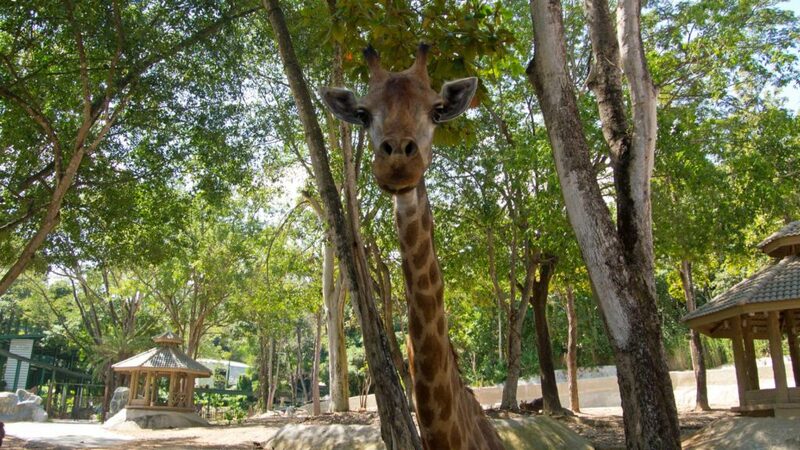 The zoo is opened daily from 8.00 a.m. to 5.00 p.m. and the entrance fee is currently 150 baht. For children it’s 70 baht. To see the pandas, the aquarium (with an underwater tunnel) or to use the monorail train you will have to pay an extra fee. This is a good opportunity if you want a little change while staying long time in Chiang Mai. It’s also a great day trip for families. 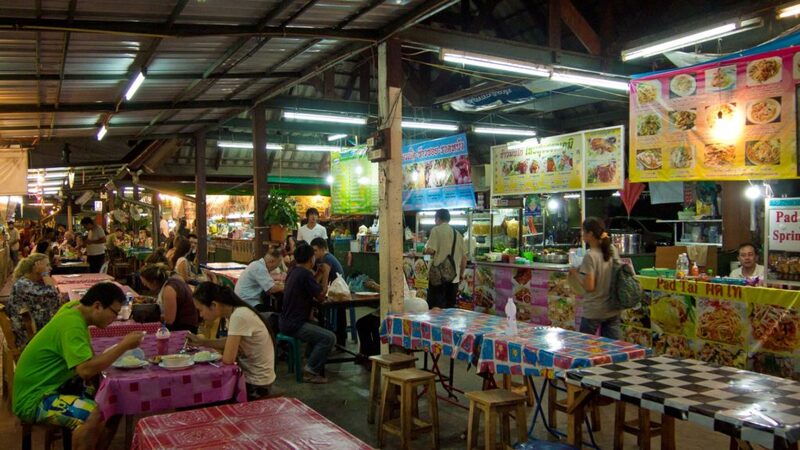 The Anusarn Market is located near the Night Bazaar or Pantip Plaza along the Chang Klan Road. Every evening you can find there many stalls selling clothes and souvenirs. There are also countless stalls in front of the market along the street where you can buy all kinds of goods. It doesn’t matter if you want to buy movies, jerseys or something else – you can find almost everything over here. Furthermore, there is a daily ladyboy show in the evening and a few massage parlors, which are attracting guests from the market. 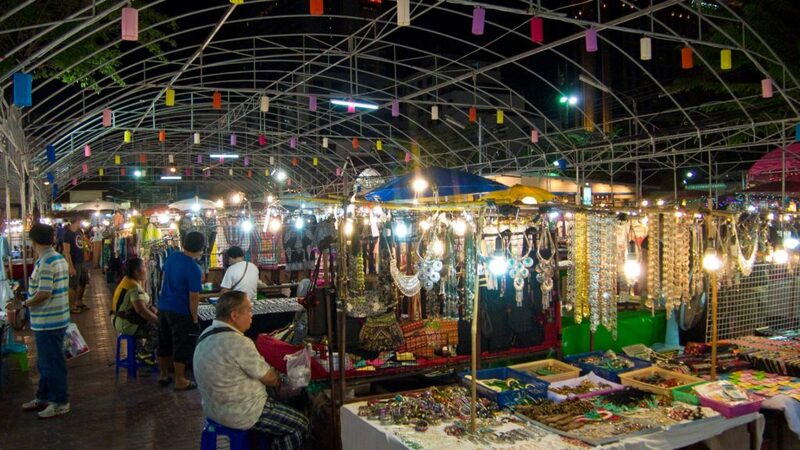 The Anusarn Market is open daily from 5.00 p.m. until midnight. Inside the market is a small food court as well, where I had dinner sometimes. Here you will find many Thai and Isaan dishes. I can absolutely recommend the Papaya Salad and mushroom soup (Gaeng Head) at the second shop on the right – simply delicious! 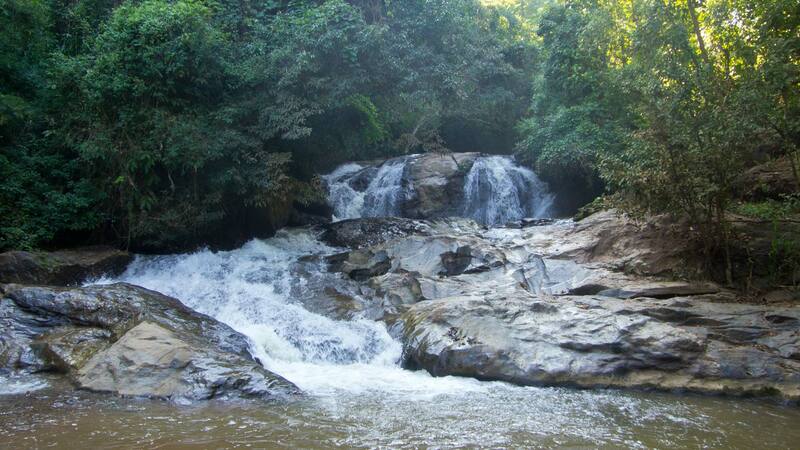 A trip to the Mae Sa waterfalls can be perfectly combined with a scooter tour in Chiang Mai’s vicinity. The ride with the scooter is about an hour along the Highway 107 from the city center. The Mae Sa waterfalls are signposted at the end. The waterfalls are located within the Doi Pui/Doi Suthep National Park and therefore you will have to pay an entrance fee of 100 baht. These waterfalls are especially very popular amongst Thais for picnicking and swimming. Despite that, it’s not very crowded in this part of the national park. 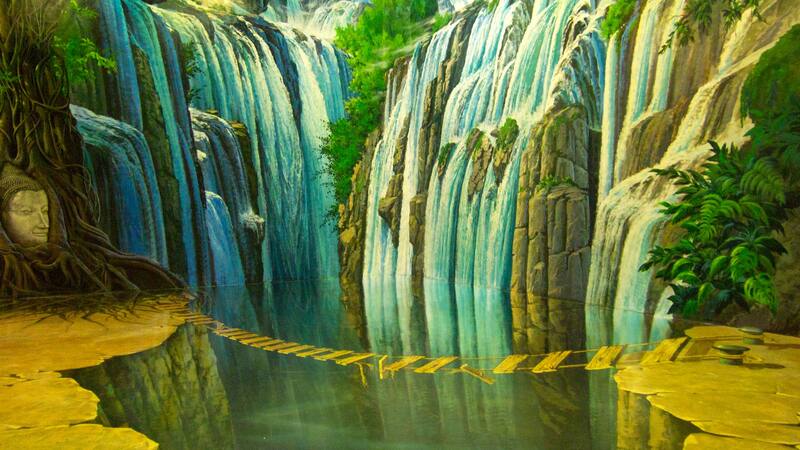 The waterfall has about 8 levels which can all be explored by walking. The upper levels are somewhat more difficult to reach than the lower ones. You can leave your scooter or car at the first level or at the parking lot at the third level. That’s completely up to you. Just arrange enough time since it’s a long way to the upper levels of the Mae Sa waterfall. If you don’t want to do the tour on your own, there are also online offers to visit the Mae Sa Valley including the waterfall on a guided tour. The Nimmanhaemin Road, often only referred to as Nimman Road, is one of the chicest and most modern districts of Chiang Mai. 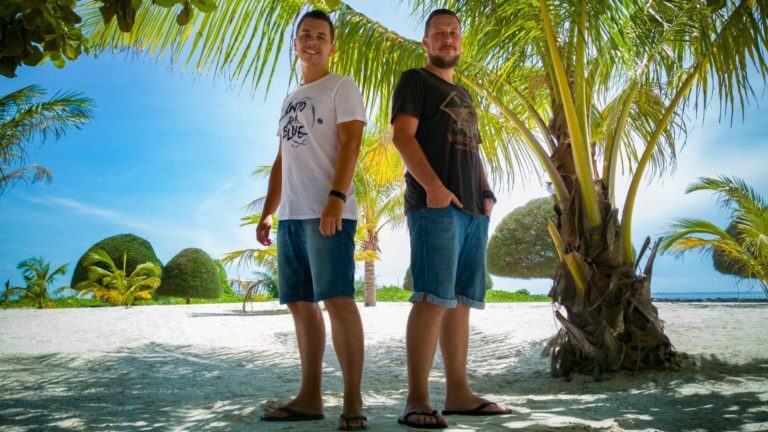 You will find countless coffee shops, restaurants, clubs and the area is really popular with digital nomads to work over here. On one end of the street there is the MAYA Lifestyle Shopping Center and on the other one the Chiang Mai University. It is the trendy district of Chiang Mai. Not only the main street but rather all the side streets where you can find even more coffee shops, bars and many more. If you want to stay in town for a while you can also find here some modern apartments. A really nice neighborhood that you should absolutely pay a visit. It’s quite the complete opposite to the old town of Chiang Mai! Have you ever been to Chiang Mai? 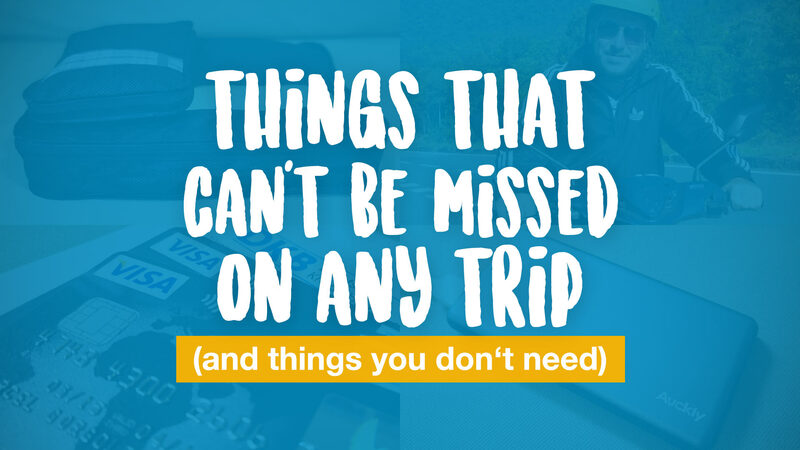 Did we miss some sights on the list which we should definitely add? Give us some feedback in the comments below! Hi Toby we have just arrived in Chiang Mai for a couple of days so still working through your recommendations. We just came back from the event of our holiday so far – flight of the Gibbon – it’s fantastic fun and we saw wild gibbons up close.. Very moving. What an adventure! You must try next time you are there. We did the artisans village tour in the same location. Also very rewarding. Have you a blog on langkawi – our next destination? thanks. Yeah, we do have one on Langkawi, but unfortunately at the moment only in German. Translation will take some time. Sorry. Wow! 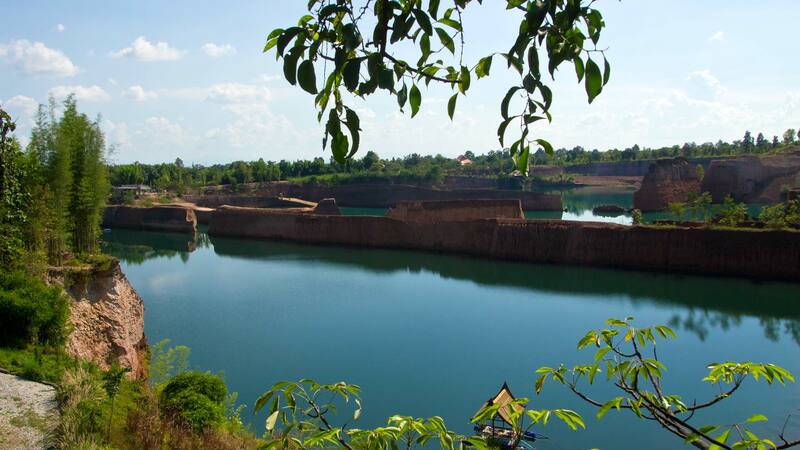 This is great blog to explain about the places of Chiang Mai to enjoying and spend the holidays. Everything is here for visit like, Temples, adventure places, night market for shopping, a lot of fun here. 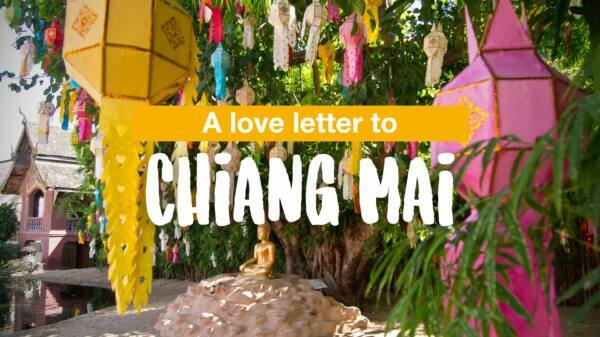 So, thank you for sharing this great blog to get information about the Chiang Mai to everyone. Thank for the great article. I can’t wait to go in December, and wrote down all your suggestions.